In September 2007, after twenty years of debate, the United Nations finally passed the Declaration of the Rights of Indigenous Peoples - a huge symbolic victory for indigenous peoples around the world who struggle under predatory and exploitative relationships with(in) existing nation-states. At the same moment, the UN was lumbering along in the 18th year of its impossible attempts to eradicate colonialism, with groups from around the world flocking to it to petition for the decolonization of their territories or to demand that their situations at least be recognized as "colonial." Across all continents, indigenous and stateless peoples are struggling for and demanding various forms of sovereignty, as the recently decolonized world is sobering up from the learning of its limits and pratfalls. Postcolonial societies that were born of sometimes radical anti-colonial spirits, now appear to be taking on the role of the colonizer, often against the indigenous peoples that reside within their borders. In places such as Central and Latin America, a resurgence of Third World Leftist politics is being accompanied by a resurgence of indigenous populism. Meanwhile the recent arrests of sovereignty/environmental activists in New Zealand represents another instance where those from the 3rd and 4th worlds who dare to challenge the current make up of today's "postcolonial world" are branded as terrorists. As scholars involved in critical ethnic studies engage with these ever more complex worlds, they are increasingly resorting to the lenses provided by postcolonial and indigenous studies. This engagement however is not without its limits or problems. As ethnic studies scholars seek to make their vision and scholarship more transnational and global, this push is nonetheless accompanied by gestures that, at the expense of indigenous and postcolonial frameworks, re-center the United States and reaffirm the solvency of its nation-state. In addition, despite their various commonalities, indigenous and postcolonial studies represent intellectual bodies of knowledge that are fundamentally divided over issues such as hybridity, sovereignty, nation, citizenship and subjectivity. The purpose of this conference, then, is to create a space where scholars and activists engaged in these various projects, in various forms, can congregate to share ideas, hash out differences and move beyond caricatured understandings of each of these intellectual projects. It seeks to ask how, by putting ethnic, indigenous and postcolonial studies in conversation with each other, we may theorize new epistemologies that may better address the violences and injustices of the contemporary world. • What are the epistemological frameworks that inform postcolonial, ethnic and indigenous studies? What is their relationship to modernity and how do they challenge and/or complement each other? • What constitutes the subject of postcolonial and ethnic studies? How does the construction of these subjectivities limit possible conversations with indigenous studies? • What are the limitations and pitfalls of sovereignty as popularly envisioned? How do postcolonial and indigenous communities reaffirm or rearticulate sovereignty within their respective contexts? • What are the different theories and strategies of decolonization as laid out by postcolonial and indigenous studies, and how do they inform each other? • How does the political status of indigenous peoples complicate dominant discourses on immigration and citizenship? Moreover, with regards to settler nation-states such as the U.S., how does the "nations-within-nations" status of indigenous communities complicate the project of ethnic and transnational studies? 250-word abstract, specifying if the proposal is for individual or roundtable presentations. The keynote speaker this year is internationally renowned critical race theorist David Theo Goldberg. The deadline for 250-500 word abstracts of 30-minute papers is December 20, 2007. Selected papers will be published in the journal Patterns of Prejudice. Scholars affiliated with the SCRS examine the historical evolution and contemporary expression of race as a social category for discriminating, organizing, regulating and maintaining social differences. By revealing that racial categories emerge in specific contexts that are connected to power, politics, economics and culture, these scholars destabilize those categories as natural or transhistorical. The point is to disclose how race operates in differing situations and texts, in order to undermine the force of racism. The SCRS is an interdisciplinary forum that seeks to facilitate a conversation by scholars across the humanities and social sciences, including Philosophy, Literature, History, Foreign Languages, Political Science, Sociology, Anthropology, and Jewish Studies. This colloquium was made possible by the generosity of the Marcus Orr Center for the Humanities, the Benjamin L. Hooks Institute for Social Change, Bornblum Judaic Studies, and the College of Arts and Sciences at The University of Memphis. Submissions are welcome in the following categories, however the suggested topics below are by no means exclusive. We particularly welcome contributors from the Mid-South region (Tennessee, Mississippi, Louisiana, Missouri, Alabama, Georgia, Kentucky, Arkansas). • What are the influences of national struggles for civil rights on global claims to civil rights? Australia is ever changing - culturally, politically, economically, artistically, historically, and geographically - and this conference seeks to investigate, and interrogate, some of those changes. How and why has Australia, and Australian culture, changed? What changes are in process now? And what changes are anticipated in the future? How has the international image of Australia changed, as well as the clichés and stereotypes? How have the lives of Australians changed, and how do they continue to change. How is the definition of what it is to be 'an Australian' changing? All abstracts must be submitted by 31 March 2008. Citizenship and Culture represent two of the most central concepts in contemporary social thought and, over the last decade, the relationships between them have been highly contested. Debates on citizenship have shifted from a focus on democracy, political rights and responsibilities and questions of belonging to a concern with culture, both formally and informally inscribed. The focus of citizenship historically tended more toward universalistic issues, with the realm of culture assigned to the particular, and to questions of difference and meaning. The interconnections between these approaches have become of growing academic interest on the one hand, as well as being of crucial significance in the political realm on the other. Thus claims for citizenship rights are increasingly required to consider the more culturally defined questions of identity, gender, sexuality, race, that are typically the concern of the new social and political movements. At the same time the issues of emancipation, responsibility and freedom remain key questions for debates concerning citizenship and culture. by the end of February 2008. NEW ISSUE - Peril - "The Meaning of Life"
Edition Four of Peril - titled, The Meaning of Life - has been released. This edition features an interview with Alice Pung exploring her meaning of life. It includes a poem inspired by Thich Nhat Hanh, the Vietnamese Zen Master, a commentary by Rosey Chang on the Dalai Lama and poetry by Hoa Pham, Rosey and George Mouradatis. We also have a sound piece by Josh Goldman, for seven voices without words and a review of a workshop Hoa attended at the University of Wollongong on Asian/Australian Values: New Directions in Australian Literature. >> The next issue will be themed "Drama" with the closing date for submissions April 30 2008 and the proposed launch date of 30 June 2008.
apwn announces a Call for Writing & Art on the theme of Auto/Biography. You are invited to send writing or art appropriate to this theme for possible inclusion in the 2008 Auto/Biography edition for the Asia and Pacific Writers Network. Writers for Part 1 and 2 include Arlene Ang, Barbara Jane Reyes, Joseph O. Legaspi, Rochita Loenen-Ruiz, Joel Toledo, Jill Chan, Linh Dinh, Eileen R. Tabios, Lino Dizon, Rebecca Mabanglo-Mayor and Grace Monte de Ramos. HEAT 14 - "Cartoon Ducks" - features writing by AASRN member Tom Cho, and Beth Yahp, an essay on Patrick White by Brian Castro, and poetry by Jaya Savige. Susan Stewart, Joan Retallack, Rachel Blau Duplessis, Lionel Fogarty. Poetic language speaks of the elusivity, the impossible seductions of the trace – trace of memory, desire, the dreams of an impossible language which encompasses, of a presence which underpins The language of poetry, with its rhythms of pulse and silence, the reflective pause of metaphor and the capacity for representation, is inextricably related to the language of memory and desire – both subjective and social. This conference broadly investigates the relationship between poetry, trace and memory and whether collective and private pasts and subjectivities can find articulation through the flexible forms of poetic language. Is poetry a mode which at least partially restores the fragments of the past or transforms them to new political and ethical ends? How does poetry negotiate bad histories and bad timing? Whose memory is being voiced or heard? What is the relationship between memory and feeling? How might new technologies impact on structures of memory? Is poetry possible today and if so, what is its future? Can poetry evidence a archaeology of desire while engaging in a politics of ethical relationship? Papers are invited which consider the theme of the trace in relation to poetry of any kind from classical antiquity to the contemporary. Is Postmodern Poetry Beyond Mourning? Is poetry possible in the new millennium? This conference is being held jointly by Monash University’s School of English, Communications and Performance Studies, and the Centre for Women’s Studies and Gender Research. This collection contains material that is scholarly in nature but unrefereed. All material is moderated in an editorial process within the Transforming Cultures Research Centre. The program launches on Tuesday 27 November 5.30pm at the Footscray Community Arts Centre, basement theatre. The program includes a short film by AASRN member Hoa Pham and Hoang Nguyen. Owen Leong's video works Milk Ring and White Noise have been selected for the exhibition Soft Power at Shanghai Zendai Museum of Modern Art (Zendai MoMA). This exhibition investigates how 'soft power' uniquely reveals and expresses itself in contemporary Asian art and culture. Curated by Shen Qibin, Binghui Huangfu and Biljana Ciric, Soft Power will exhibit work by 30 major contemporary artists including Lida Abdul, Heri Dono, Shilpa Gupta and Song Dong. EXPRESSIONS OF INTERESTS are sought for a Research Assistant on an ARC Discovery Project, "The ABC in Asia and its role in cultural exchange(1956-2006)". To express your interest in the position send a brief CV (no more than 5 pages) and a statement outlining your skills experience and motivation relevant to the position to Dr. John Tebbutt: john.tebbutt@latrobe.edu.au. EOI DEADLINE: Monday, January 21 to start early February. >> For more information about the project, download the EOI document (PDF, 106K). Contemporary Australian Poetry in Chinese Translation (Shanghai: Shanghai Arts and Literature Publishing House, 2007) co-edited by John Kinsella and Ouyang Yu, and sole-translated by Ouyang Yu, has just been published in China and is now available in Australia. 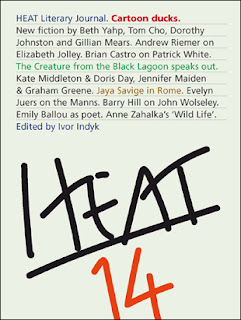 It contains 100 poems by 100 contemporary Australian poets, is 213 pages and the first one of this kind in twenty years. Paralleling economic developments, many Australian poets are connecting with Asia's diverse cultures and adding a new dimension to a national poetic tradition steeped in European and North American influences. Anthologies can provide a good indication of such shifts in the poetic landscape. Last year's publication of Windchimes: Asia in Australian Poetry (Pandanus Books), edited by Noel Rowe (who died in July) and Vivian Smith, is in this sense a watershed. Ordered chronologically, Windchimes begins with The Bulletin verse of the early 20th century -- shrouded in fear and anxiety, particularly towards China -- and brings us up to speed with such recent works as Judith Beveridge's Between the Palace and the Bodhi Tree, Emma Lew's adaptations of the Malaysian pantoum form and works by Chinese-Australian poet Ouyang Yu. As Canberra's Geoff Page noted in a review, the anthology is nothing less than "an index to our changing attitudes towards Asia and its peoples". >> DISCUSSION about this article and issues surrounding it appear in Adam Aitken's blog HERE (12 Oct) and HERE (4 Oct). 8th International Conference of the Australasian Children’s Literature Association for Research (ACLAR). “We’re not in Kansas any more, Toto!” Only in Oz can Dorothy have the fantastical journey that includes witches and wizards, talking animals, a living scarecrow and magic slippers. And yet at the end of her adventure she concludes that “there’s no place like home”. What role then do reality and fantasy play in children’s literature? Does fantasy rush in where the real-world fears to tread? Is there any reason to believe that fantasy feeds the child’s imagination better than an imagined story written within realistic conventions? Or is it pure escapism that needs to be grounded in reality to be relevant to the young reader? And how far removed is fantasy from reality? Harry Potter lives in the real world but with added magic; Pullman’s His Dark Materials crosses between our real world and alternative realistic (non-magical) worlds; Lemony Snicket’s A Series of Unfortunate Events is set in an absurdly unrealistic real world. Once back in Kansas Dorothy is astonished to find that in Oz “you – and you – and you – and you were there!” So with the many combinations, crossovers and overlappings between reality and fantasy, is there even a clear separation between the two? Confirmed as plenary speakers for the conference are Professor Rod McGillis, of Calgary University (books include The Nimble Reader: Literary Theory and Children’s Literature and Voices of the Other: Literature, Colonialism, Postcolonialism and Neo-colonialism) and Bernard Beckett, one of New Zealand’s leading writers for young adults (books include Jolt, Home Boys and New Zealand Post Book Award winner Genesis). Please send abstracts (300 words max) to Anna Jackson (anna.jackson@vuw.ac.nz) by 31 January 2008. Papers should be no longer than 20 minutes. Offers of panels welcome. The date, venue and fees for the upcoming 'Rediscovered Past: Chinese Heritage in Northern Australia' have now been finalised. The conference is to be held at the Cairns Public Library on 16-17 February 2008. This is also a gentle reminder to all who are interested in attending or presenting a paper to let the organisers know by December 2007 if possible so program and numbers can be finalised. Please feel free to send this message on to anyone else who you think might be interested. Regarding the papers and presentations, we welcome people from a wide range of backgrounds, not just the academic, to get involved. Those of you who don't feel up to writing a formal paper but feel that you have something interesting and stimulating to add to the research on Chinese heritage in northern Australia can still consider giving a talk. China Inc can provide feedback and guidance to assist in developing your talk if required. Formal papers will only be sought from those who wish to have their presentations published in the Conference Proceedings volume that will be produced afterwards. >> Download 2008 conference information (MS-Word) and abstract submission form (MS-Word). * creative development of new intercultural performance projects. Supported by the Theatre Board of the Australia Council, TransLab offers space, fees, technical and dramaturgical support and travel costs to collaborative teams of artists engaging in inter-cultural or cross-cultural performance work. Deadline for applications is 15 NOVEMBER 2007. >> FOR TRANSLAB GUIDELINES, CLICK HERE (PDF). Interested scholars and practitioners are invited to submit abstracts for 20-minute papers, panels, writing workshops and roundtable discussions. Topics might include: genres and forms; tensions between the ‘real’ and the ‘fictional’; the profusion of genres and sub-genres in contemporary life writing; true crime; travel writing; nature writing; poetry/poetics of the self; reportage; biography, memoir and autobiography; ficto-criticism; DIY media; the pedagogy of creative non-fiction. Postgraduate researchers are warmly invited to participate. Abstracts and expressions of interest should be forwarded to the conference co-convenor Dr Ros Smith (Ros.Smith@newcastle.edu.au) no later than January 18, 2008. ‘The Art of the Real’ is presented by the Literature, Cinema, Culture Research Group, School of Humanities and Social Science, University of Newcastle, Australia. NEW ISSUE - Griffith Review - "In the Neighbourhood"
"In the Neighbourhood" is ripe with fresh essays, reportage, memoir, fiction, poetry and photography exploring the complexities of engagement with our regional neighbours. On the eve of the Federal election, this edition puts flesh on the bones of a crucial issue, one which demands informed public discussion. Writers include Brian Castro, Jane Camens, Ouyang Yu, Bei Ling, Hoa Pham, Nicholas Jose, Geremie R. Barme, Adam Aitken and others. In association with the Ocean of Stories conference there will be a Postgraduate and Early Career Researchers Masterclass held on the afternoon of Wednesday 6th February 2008. A subsidy of $250 per person towards travel and accommodation costs is available. Please email expressions of interest to Dr Lola Sharon Davidson at Indian.Ocean@uts.edu.au. This conference follows on from a conference entitled “Culture and Commerce in the Indian Ocean” which was held in Leiden, The Netherlands, 25th – 27th September 2006. That conference was about cultural and commercial relationships and patterns in the Indian Ocean from pre- to post-colonial times. It had as its aim to bring the interdisciplinary paradigm of Cultural Studies to the Indian Ocean, building on the already substantial work done in Anthropology, History, Geography, International Studies and other social and political disciplines.